It took just a day for them to find and buy a spacious apartment with ornate painted ceilings in the center of Riga, at a bargain price by Moscow standards. Just like that, Mansky became one of the 3,173 Russian citizens who gained the right to reside in Latvia last year. The Latvian capital is just a 90-minute flight from Moscow. Most of its residents speak Russian. But the main attraction of Latvia’s “residency for property” program is how cheap it is, compared to similar “golden visa” programs in Europe. In Latvia, anyone who buys property can get a five-year residency permit that lets them travel and live freely in most of the European Union. How much you need to invest varies, depending on where the property is located, and the two most popular areas for foreign investment are the two most expensive. For example when Mansky bought his roomy flat in Riga, he had to spend at least € 142,000 (US$ 162,000). He would need to pay the same in the Jurmala seaside resort, popular spot for Russians since the Soviet Union times,. Outside of Riga, an investment of only € 70,000 (US$ 80,000) was required. Over the past five years, 13,518 foreigners – enough to populate a small town – have obtained residence permits under the program, which until recently was the cheapest in Europe. 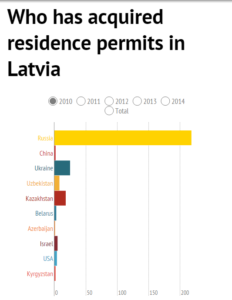 Unlike similar programs in other European countries, 90 percent of Latvia’s applications come from the former USSR states, mainly Russia whose citizens have obtained 10,000 of the permits. The number of applications grew rapidly after the start of the pro-European protests in Ukraine in late 2013 and Russia’s 2014 annexation of Crimea. Twice as many people from Ukraine applied in 2014 as had in the previous year. The wave from Russia began after Putin was re-elected president in 2012 and continued at almost the same level last year. Mansky was born in Ukraine but spent most of his life in Moscow. He founded ArtDokFest, Russia’s independent documentary film festival, and has won international awards. 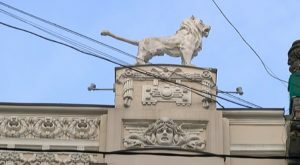 The director says the supportive attitude of the Russian authorities changed when he decided to make a documentary on the events in Ukraine, viewed through the prism of his own family’s history. While his project won initial backing from the Russian Ministry of Culture, that soon changed. “They began saying the film would be delayed as the situation in Ukraine was unstable and, God forbid, that our best director would end up there. I could understand that they were lying,” Mansky says. Eventually, the minister himself made the situation crystal-clear: “While I am the Minister for Culture, no project which is associated with Mansky will receive state support,” the director revals. Officials in Riga don’t know how many of the 10,000 new immigrants from Russia are similar to Mansky, or who among them may have darker histories. Despite Latvia’s reputation as a haven for money-laundering, officials don’t even know if the money that is flooding in may have been stolen from countries of the ex-Soviet bloc or acquired in some other nefarious way. And there are grounds for concern. In 2013, police in Rome raided the home of the relative of the fugitive Kazakh oligarch Mukhtar Ablayazov, an opponent of the current president of Kazakhstan who is wanted in several jurisdictions for alleged financial crimes. Ablayazov escaped the dragnet; he was later picked up in France, where he is fighting extradition. Italian officials discovered his wife and six-year-old daughter were living in Italy thanks to residency permits from obtained from Latvia and the United Kingdom (UK). Those papers entitled the Ablayazov family to travel or live anywhere in the European Union they wished. The Latvian permit opened the door to all 26 countries of the Schengen group; the second permit was necessary because the UK isn’t in Schengen. The case caused an uproar in Italy. Italian officials deported Ablayazov’s wife and daughter to Kazakhstan, which later allowed them to return to Italy where they received refugee status in 2014. Ablayazov remains in custody in France, where his extradition trial is underway. 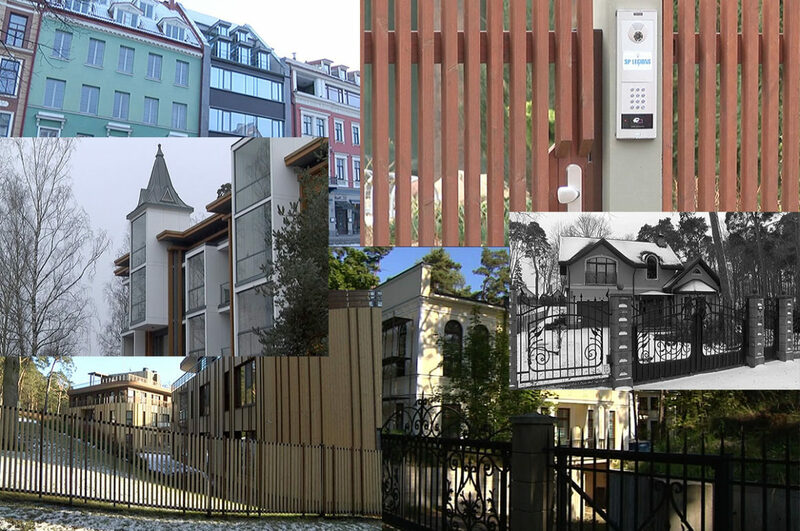 Over the past year Re:Baltica collected information from land, property and business registers in Latvia and analyzed the 315 most expensive real estate deals in Riga and Jurmala with foreign investment. 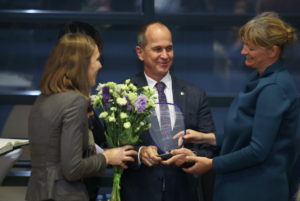 The purpose was to get a snapshot of the people who, during the turbulent times in Ukraine and the growing standoff between the West and Russia, have opted for Latvia’s “golden visa” program. In particular, reporters sought to discover the origin of the money. The investigation reveals that over the past year, most of the buyers were from the Russian middle class, which Re:Baltica defines as well-off to affluent but not super-rich, such as businesspeople and middle managers. A number were connected with medium-sized private businesses, especially in the financial sector. Most of the surnames were not well-known, possibly because the properties were purchased under family members’ names, or the buyers were not public figures. Some could be identified as Russian journalists and artists. 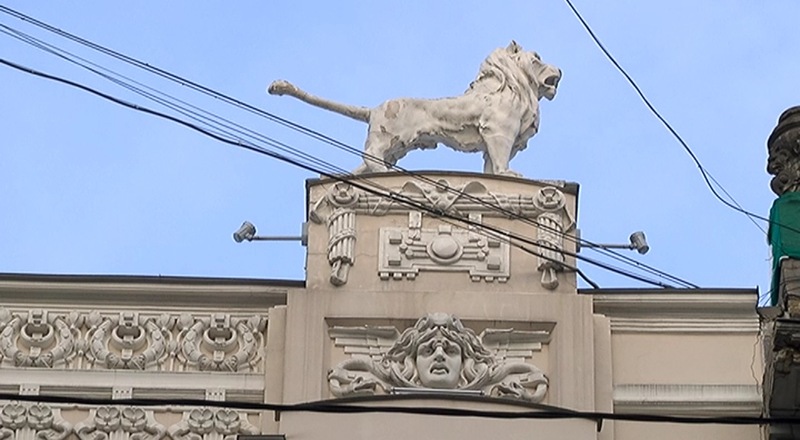 Satirist and television personality Mihail Zadornov added to his real estate portfolio with an apartment in one of Riga’s celebrated Art Nouveau buildings. Two others are new neighbors thanks to purchases in Jūrmala: actress Tatyana Dogileva and Yury Askarov, one of the faces on the Russian humor show KVN. A small number of permit holders are managers of state-controlled companies or their subsidiaries, particularly those connected with the energy giant Gazprom. They include Nikolai Korenev, a deputy board member at Gazprombank, which is subject to US and EU sanctions, and several managers at Transtelekom, a subsidiary of the state-owned giant Russian Railways, whose CEO is is among Putin’s inner circle. Residence permits have also been obtained by Aeroflot’s Deputy Director-General Vadim Zingman, and two former top employees from the banks VTB and Bank of Moscow or their relatives (both banks are subject to EU and US sanctions). 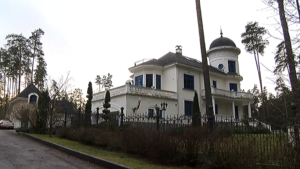 The family of Alisher Usmanov, named by Forbes as Russia’s richest man, concluded one of the most expensive deals, spending nearly € 4 million (US$ 4.5 million) for a villa in the resort town of Jurmala, but apparently did not apply for residence permits (there is no legal requirement to do so). His wife’s son, who is the legal owner of the property, did not respond to inquiries. Dmitry Orlov, a political scientist with close ties to the Kremlin and a member of the Supreme Council of Putin’s party United Russia, denied in a phone conversation in early February that he’d received a residence permit, but not that he’d bought property in Latvia, a country regularly criticized by official Moscow. The data in the property register matches Orlov’s name and date and year of birth. No one answered the posh apartment’s doorbell in Riga. This group has joined other former Russian parliamentarians from Putin’s party, now businessmen, who bought real estate in previous years and whose families hold residence permits. 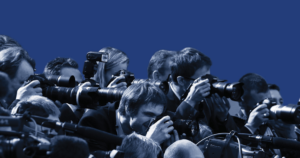 Among them are Eduard Yanakov, who apart from a metallurgical business has a stake in Latvia’s Russian language media, and Vladimir Shemyakin, who until recently was a leading official in Gazprom Media Holding, a subsidiary of Gazprombank. “As Gazprombank is not a state company, this theme is not important to us,” Re:Baltica was told by Gazprombank’s press office. Both Shemyakin and Yanakov declined to comment. Re:Baltica partner TV3 reported on its investigative program “Nothing Personal” that Putin’s close friend, multibillionaire Arkady Rotenberg, was one of the first to obtain a residency permit in 2010, although he has since allowed it to expire. He did not get the permit by buying property but by depositing money in a bank, the least transparent way of getting a permit. Prior to the EU and US sanctions, Arkady Rotenberg and his brother Boris Rotenberg owned SMP Bank in Latvia. Both Rotenberg brothers are considered close to Putin and on US/EU sanctions list; property owned by Arkady Rotenberg in Italy was seized when the sanctions kicked in. 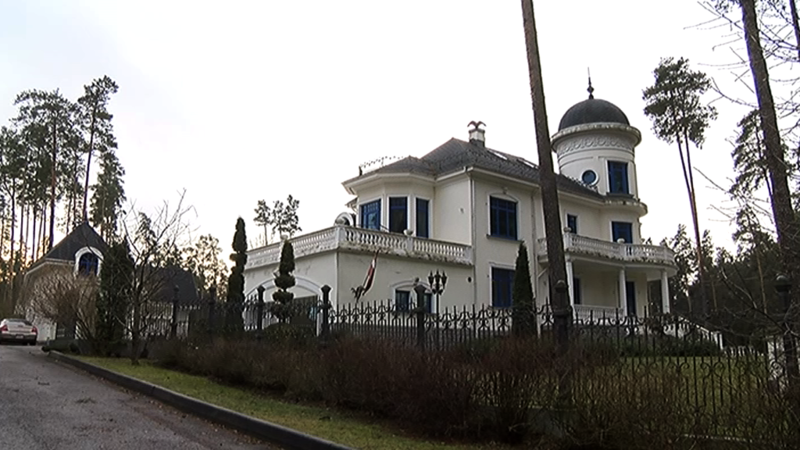 Boris Rotenberg owns a property in a quiet and rich residential area in Garkalne, not far from Riga, via the company. As he holds Finnish citizenship he did not need to apply for a residency permit. In August of 2014 Boris Rotenberg transferred his shares in the company which owns house to his son, Roman Rotenberg, who is the vice president of Gazprombank and the vice-president of SKA Hockey Club. Shortly before US and EU sanctions came into force, bank’s shares were transfered to local residents. 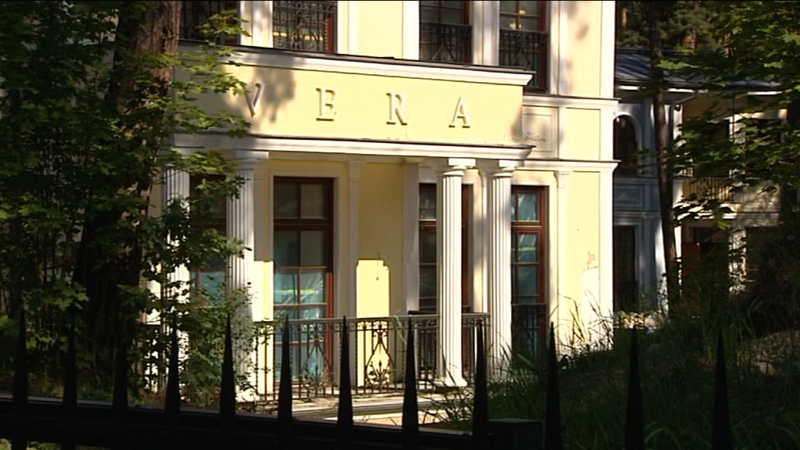 Others in the Russian expat community say that the decision to invest in Latvia was personal, not political. “It’s a dream I’ve had for a long time. The city is interesting and I just wanted a little nest there,” explained Russian investor Alexander Rudik who is on the board of directors of a Swedish-owned timber company operating in Eastern Siberia, RusForest. “Also, there is a good corporate tax system for business in Latvia, and I’ll consider whether I should transfer part of my business operations there. I’m not thinking about living in Latvia permanently, it’s more a summer home thing. I will seek a residence permit though, as it’s useful for travelling freely around Europe”. Unofficial but trusted sources said that among the applicants for permits are people who are connected with Rosneftj, Rosneftegaz, Rosatom, Lukoil, Nacionalnaya gazovaya kompanya,Transneftj and others, but Re:Baltica was unable to identify them in the survey of the most expensive real estate purchases during the last year. Fifty years of Soviet occupation and attempted Russification helped drive down the percentage of Latvians in the country. The demographic changes have left the country with deep scars and a sizeable amount of Russian-speakers (26.9 percent of the barely 2 million people are Russian). A large portion of them do not hold Latvian citizenship and, fairly or not, some Latvians question their loyalty to Latvia. The recent influx of Russian citizens entering Latvia under the residency program has alarmed nationalist politicians, who worry that the new residents will be unwilling to become a part of Latvian society. The nervousness was exacerbated by the fact that Putin cited the “protection of compatriots” as a reason for aggression in Crimea. “By continuing to issue residence permits to Russian citizens, we are playing Russian roulette in the true sense of the term,” center-right National Alliance member Edvīns Šnore said in Latvia’s parliament last year. 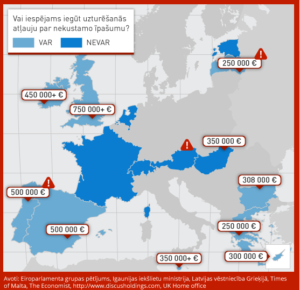 In May 2014, the parliament raised the value of the required real estate purchase from a minimum of € 70,000 to € 250,000, putting Latvia on a par with Greece, which previously had offered the next cheapest property investment requirement in Europe. experience with “golden visas” click on the image. The new threshold, plus the dramatic fall in the value of ruble, resulted in a sharp drop in the number of purchases. Since September, when the new legislation came into force, 67 applications for permits have been filed. But, with the rapid cooling of the Latvian economy, the real estate lobby has renewed its fight to get the lucrative business back. 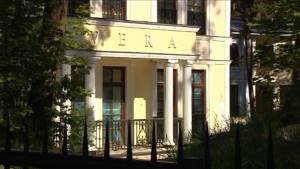 A member of Parliament from the ruling party, Unity, has submitted a bill which would drop the investment threshold well below the initial levels: the minimum investment would be € 50,000 for not one but three properties outside Riga. The lobby, which represents wealthy businessmen, real estate developers and banks whose client base is mainly people from the former Soviet Union, notes that since the economic crisis builders of new projects have focused on foreign buyers. Lobbyist Viktors Valainis, a former member of Parliament, says if these projects are halted, investments worth € 200 million (US$ 228 million) and employment for 5,000 people in associated sectors will be at risk. The stance is strongly opposed by nationalist members of the ruling coalition, the country’s Defense Minister Raimonds Vējonis of the Greens and Farmers Party and also the security services. They says they are worried less about an inrush of illegal funds or organized crime than about the possibility that due to the large number of applicants, they will be unable to screen out people who are a danger to state security. “The law which is currently in force has reduced potential risks. Looking at it from the aspect of national security, I can’t see the need to make any changes,” said Chief of Security Police Normunds Mežviets.